I was sent the new BYS Colour Change collection a couple of weeks ago to review and I have been so excited to do try them, but unfortunately other things kept getting in the way. So today I told myself that when I got home from work, I was going to swatch the collection and nothing was going to stop me! What I didn't count on was how freakin' cold the weather has become over the past few days!!!! The whole point of "mood polish" is that it changes with your body temperature. So, if you hands are icicles, like mine were tonight, then the polish ain't changin!!!!! I tried to swatch them and then stick my hands under warm water, at which point the colour change would happen, but in the process I would ruin the mani because I wasn't waiting long enough for the polish to dry. So in the end, I resorted to swatches on a nail wheel, which is something I have never done before on this blog! Please forgive me Director Dave and my lovely followers! I want to state from the outset, that these polishes do change colour! They just weren't changing enough on my frozen hands to be able to photograph them properly! I also want to point out that regardless of their colour changing capabilities, I really love the colours of these polishes! So lets take a look! First up, we have the colours at normal room temperature, which at the moment, is pretty cold. I used three coats for every colour, but you could probably get away with two coats for all the colours except for Blue Glitter, Purple Glitter and Bright Purple. Next we have the colours, when they are warm. As you can see, there has been a distinct change in Royal Blue, Blue Glitter, Salmon, Bright Purple and Purple Glitter. The change in Blue and Bright Pink was more subtle. 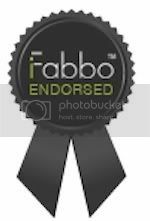 And now the best for last! As the swatches cooled down, it created this awesome gradient effect on the nail wheel, with the "cool" colour on the nail tip and the "warm" colour near the nail bed! I wish I could have nails like this always! Especially with Salmon and Bright Purple! Despite the difficulties I had trying to swatch these, I really did like the colours in this collection. I would have liked the two glitter colours to be a little more opaque, but apart from that I don't have any complaints! What do you think? 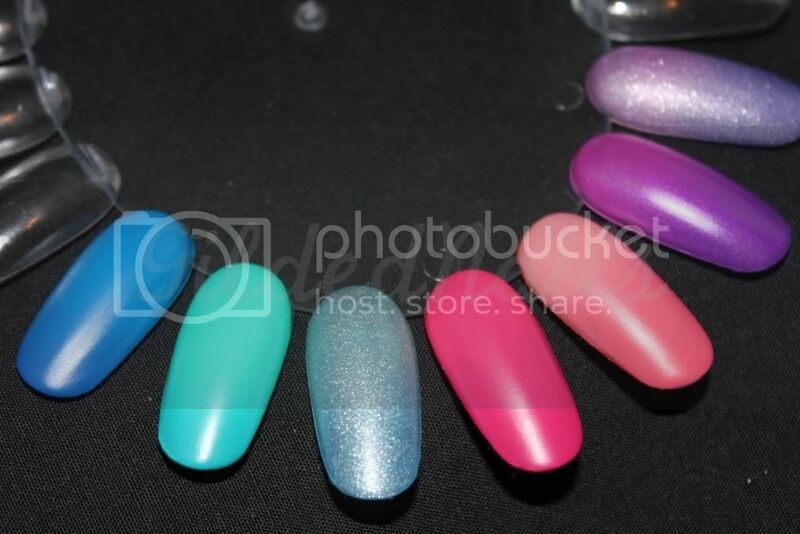 You can get your hands on these BYS colour changing polishes at Fashion Addict for $4.95AUD each. Don't forget, Fashion Addict ship to the USA! Some of these colors look very similar to the ones we have here at Claires and Meijer stores, but there are a couple combinations that I haven't seen before and am hoping we get soon. I'm loving the gradient effect with the pink and purple. I've wanted to try out a color changing polish for a while, but I'll have to wait until my nails are much longer. 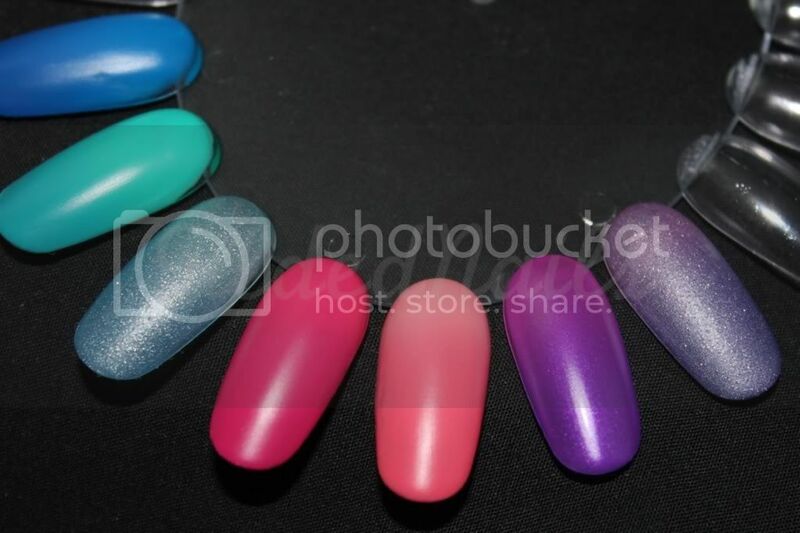 So pretty love mood polishes, to bad they don't sell it in Holland. Omg these are so hott!!!! I love it! I have yet to swatch mine....no time!! The purple is one of my favourites! It has a really gorgeous subtle shimmer! You should contact Fashion Addict and see if they ship to Holland?? I agree, I think long nails are necessary so you get the full effect! 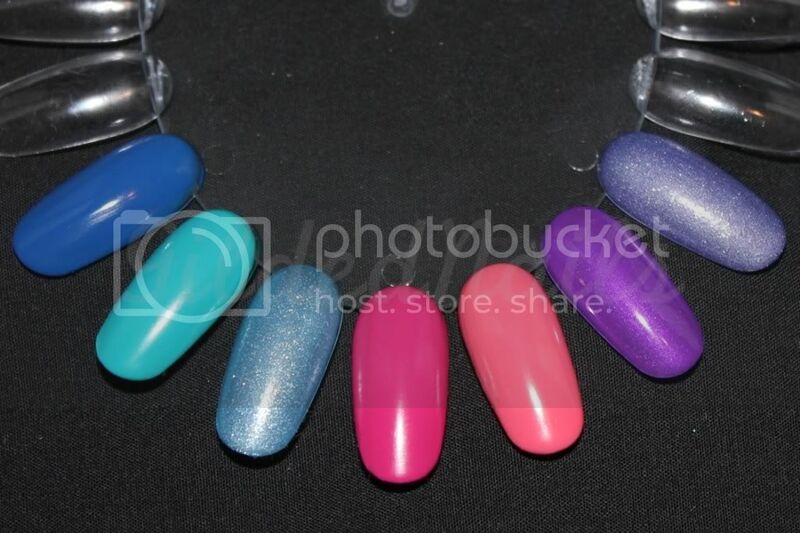 I've always wanted to try the Claire's mood polishes but they are so expensive on ebay! Yeh they are awesome colours! These are all so pretty. I never bother with these type of polishes. My hands are always cold! I have nubbins so wouldn't be much of a gradient effect.